Carolina jessamine is a vigorous vine that produces twining stems without the aid of tendrils. Masses of fragrant, funnel-shaped flowers emerge in late winter to early spring, in shades of golden to pale yellow. Dark, glossy foliage on rich brown stems is the perfect complement to the brightly colored blossoms. Vines will quickly cover fence lines, trellises, or anything nearby for that matter! Because they don’t produce tendrils, the vines will need a support structure to grow on. However, it can also be used as an attractive groundcover. If used as a groundcover, only shear it after blooming in spring. 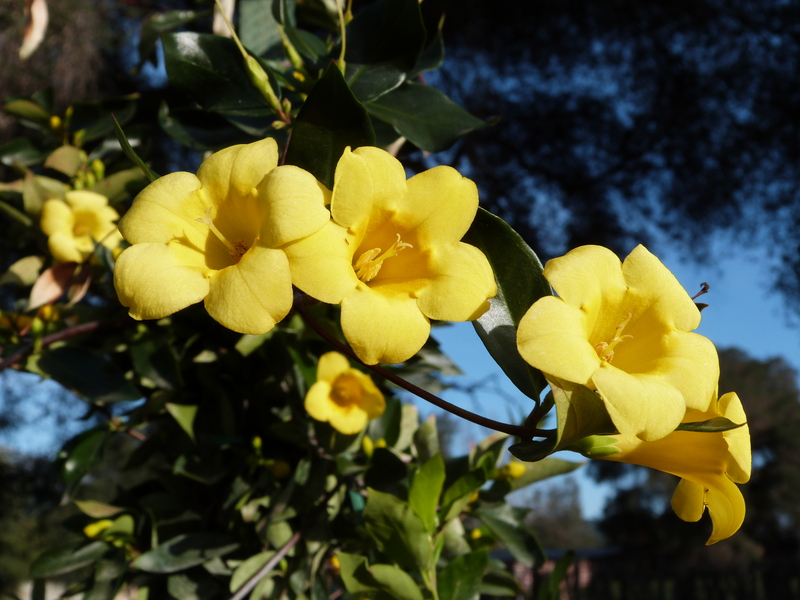 Carolina jessamine thrives in full sun but it can also tolerate part shade. Know that vines produce fewer flowers in shadier conditions. For best performance, soil should be moist, well drained and fertile. To control the vine’s size, you can cut it back to 2-3’ tall immediately after vines finish blooming in spring. Take note that all parts of the plant are poisonous.